When either the false folds or aryepiglottic folds adhere to each other. 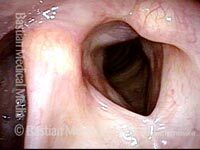 This supraglottic web narrows the laryngeal vestibule and distorts the normal contours of the larynx. This is an uncommon diagnosis, and is usually either a complication of cancer-treating radiation therapy or else is the result of trauma, such as from a gunshot wound or severe blunt trauma to the larynx that causes fracture and tears the mucosa. 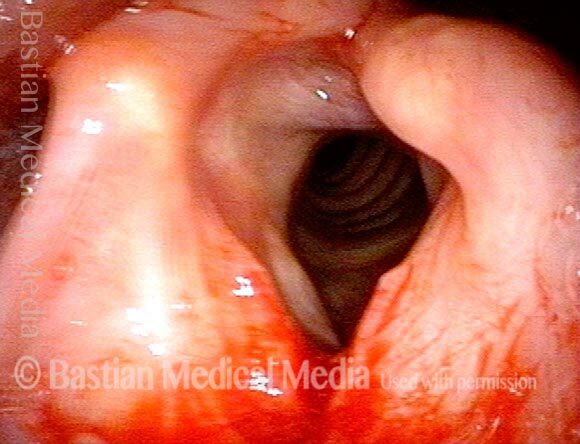 Two months after the operation, the patient reported that breathing was much improved; voice quality was also better. Supraglottic web, at the level of the false cords, is narrowing the airway. The true cords are mostly hidden beneath the overhang of this web. 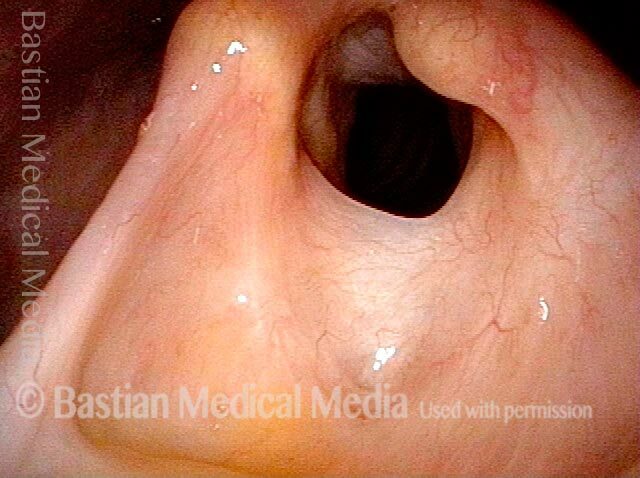 Same patient, with cords in phonatory position. The web also gives this patient's voice a muffled quality. The web is being divided. In view on the right is the forceps and blade, wrapped with tape. This procedure was performed using only topical anesthesia. The airway can now function at normal capacity.